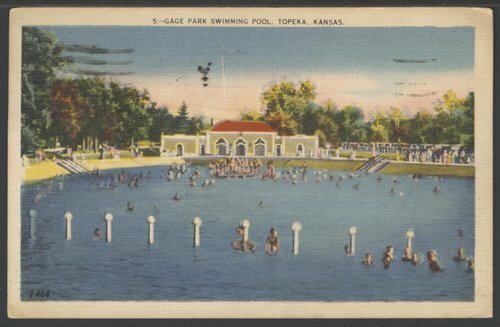 This postcard shows the Gage Park swimming pool located in Topeka, Kansas. At the time this postcard was published, this was one of the largest concrete pools in the Midwest. It was 460 feet long , 65 to 170 feet side, and had an electric fountain, slides, chutes and a sand beach.